STAROBESHEVE, Ukraine — As the survivor of a tank attack on a Ukrainian army truck was being carried into an ambulance, he was showered with verbal abuse by a rebel fighter. 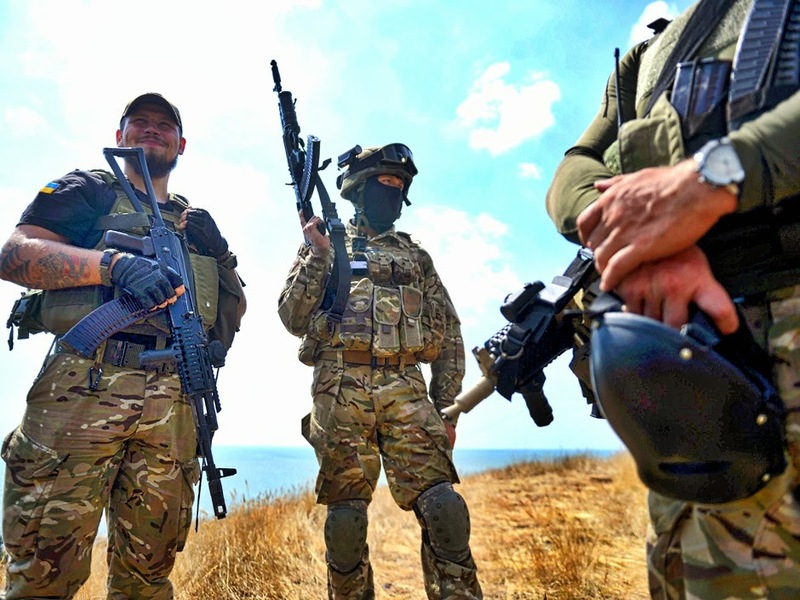 Ukrainian loyalist fighters from the Azov Battalion stand guard on a hill on the outskirts of Mariupol on August 30, 2014. Pro-Russian rebels in east Ukraine warned on Saturday that they will launch a fresh offensive against government troops, days after seizing swathes of territory. “Why didn’t you say before that you were alive? Why so quiet?” the rebel taunted. Minutes later, the Ukrainian soldier drew his last breath. Under the gaze of rebels, Ukrainian soldiers loaded the bodies of six other dead comrades onto trucks outside the village of Starobesheve. A couple of kilometres away, in the village itself, other rebels made wisecracks and boasted about dealing another punishing blow to Ukrainian forces. After weeks of yielding ground, the Russian-backed separatists are brimming with confidence following a string of seemingly effortless victories. On Saturday, Ukraine announced it was abandoning Ilovaisk, a city 25 kilometres north of Starobesheve. Surrounded on all sides over several days, they sustained fire so intense that the government was compelled to plead for a corridor out. “We are surrendering this city,” said Ukrainian Col. Andriy Lysenko, a spokesman for the national security council. Lysenko said that regular units of the military had also been ordered to retreat from Novosvitlivka and Khryashchuvate, two towns on the main road between the Russian border and Luhansk, the second-largest rebel-held city. Adding to that, Ukrainian government forces are now facing the prospect of an onslaught from yet another front along the coast of the southeastern Azov Sea. Ukraine and numerous Western governments have said they believe rebels have been amply supplied with powerful Russian weaponry and that regular Russian troops are engaged in combat. NATO estimates that at least 1,000 Russian soldiers are in Ukraine even though Russia heatedly denies any involvement in fighting that has so far claimed at least 2,600 lives, according to U.N. figures. Preparations for the evacuation from Ilovaisk were spotted by AP reporters Saturday morning in the village of Mykolaivka, 50 kilometres (30 miles) away, where 20 flatbed trucks were parked in line primed to go and collect stranded Ukrainian troops. Anxious Mykolaivka residents reported hearing blasts of artillery Friday and the convoy made painstaking progress throughout the day to avoid rebel ambushes. After more than an hour’s travel through tortuous country roads, the convoy reached the countryside outside Starobesheve and joined up with about 15 government ambulances readied to collect the wounded. As drivers awaited the order to move, a green army truck drove in from the opposite direction packed with weary and evidently traumatized soldiers. Speaking over one another, they said rebels reneged on promises to provide a safe corridor out of Ilovaisk and opened fire on departing Ukrainians troops. Although palpably frustrated with what they see as fatally indecisive leadership from the authorities, rank-and-file troops are reluctant to go on the record with their complaints for fear of reprisals. But their rage Saturday was mainly reserved for their opponents. “We came from Ilovaisk bearing white flags,” said one soldier, who declined to give his name and had his face covered with a mask. While none could offer a specific estimate of how many had died, they said the deaths may have numbered in the dozens. Ukrainian National Guard Lt. Col. Mekola Hordienko, who was accompanying the evacuation operation, said the attack on departing soldiers constituted a violation of international conventions. The surrounding area has been scene of skirmishes and shelling attacks over the past week. In Starobesheve, the dozens of rebels milling around the otherwise deserted rural settlement were jubilant Saturday over having trapped a column of Ukrainian tanks and armoured personnel carriers after a brief battle that morning. Standing in groups, some fighters shared jokes and battle stories, while one showed off pictures taken on his phone of insignia from troops in the trapped Ukrainian battalions. At one stage in the afternoon, three rebel tanks raced up to the local police station, which now operates at the local rebel headquarters, only to be angrily ordered back down the hill by the local commander. One separatist fighter, who provided only his first name Sergei and the nom de guerre Frantsuz (Frenchman), said the Ukrainian armoured column was intercepted while it was travelling to Ilovaisk to assist in evacuating government troops. “They wanted to take Starobesheve, but this operation failed,” he said. After hours of negotiations, dozens of Ukrainian troops were allowed to leave the village riding on six APCs, but without ammunition. Frantsuz said rebel commanders agreed to allow ambulances and trucks to travel to Ilovaisk to take away the injured and the dead. Near a bridge on the road out of the village, six bodies lay in disarray around a medical truck that was torn apart by a rebel tank shell. Ukrainian army personnel dragged away the bodies with cables — a precaution adopted to avoid impact from possible unexploded ordnance. A man in the recovery group wretched after one especially mangled body was loaded into a truck. Although the bodies showed signs of having lain in the open overnight, one severely injured man in the crew was found to still be alive and was carried away for treatment. About half an hour later, he too died and was tipped face down into the back of the truck along with the other men. quote: "Военного комиссара Амвросиевского районного военного комиссариата подполковника Владимира Московку, которого ранее задержали российские десантники возле Амвросиевки и передали членам незаконным вооруженных формирований в Снежное, показательно подвергли пыткам, в результате чего он скончался, сообщает пресс-служба Министерства обороны Украины." This is outrages, how any self respected Government can negotiate with such terrorist? Quote: "Только Украина может договориться с Новороссией об урегулировании конфликта, приняв во внимание интересы населения востока, заявил Песков." It is very good, now there is no such territory as "Novorosia" there is Donbas an Eastern part of Ukraine. Ukrainians do not call Kuban or Taganrog "Novoukraina". Russia should stop propaganda of made up "Novorosia" it is non sense.